Gilt, glamour and stuffed creatures! I can never resist the opportunity to fossick in amongst old 'things' and Fremantle has many fine antique shops. Stuffed animals are not something I've seen a lot of but apparently taxidermy is alive (?) and well in Australia! ... because when I returned ten minutes later after further fossicking .. check it out, a SOLD sticker! As difficult as it was to imagine the chandelier hanging it was impossible to imagine a stuffed fox on my mantlepiece :) Wish I had asked how much it sold for, what do you think, it doesn't look like it but it really was big, would love to see it in situ.. perhaps over an elegantly laid oak dining table.. Bus Stop Cafe and a big ship! It was a grey day in Perth yesterday, menacing clouds that were all show and no action! On the way to Fremantle to take some shots of the most amazing piece of new art (will I be able to wait until Monday to show you that is the question) we came across the super cool Bus Stop Cafe parked by the beach and seriously, is there ever a time not to stop for coffee, especially on a grey day! Couldn't get the National Geographic telescope above to work so whipped out my trusty camera et long lens to see what was sitting out there on the horizon and look.. we have visitors. The USS Carl Vinson docked for a few days R&R.. hello sailor :) or should I say sailors, there are about 5000 of them! Watching the smaller vessels buzzing around the battleship made me think of the oxpecker birds on a hippo another large, grey and dangerous water body. Happy Wednesday, take care and stay safe..
A tribute from one artist to another..
On the way to Central Gallery on the weekend Aimee and I were thrilled to discover this portrait on the Central TAFE building in Northbridge. Painted during Form PUBLIC 2015 by Australian artist Luke Cornish aka E.L.K. as a tribute to rapper Hunter, a founder of the Perth hip hop scene in the 1990's who died at the age of 36 of neuroendocrine cancer. Every time I read about talented musicians passing away, I like to imagine there's one heck of a jam session going on somewhere, perhaps in a parallel universe, I hope so anyway! It was interesting to discover that E.L.K. was the first stencil artist to become a finalist in the prestigious Archibald Prize, the largest portrait award in Australia, I always enjoy it when I find his work around the city. Happy Tuesday, take care and stay safe.. This little blogger went to market.. I wish I could explain the image above.. but I have no idea :) Years ago it was my Sunday morning ritual to zip up to the Wanneroo Markets to buy fresh flowers for the week, yesterday I went for the first time in ages. It looks like they are encouraging the ever popular at the moment 'pop up' shops and it's quite possible that it may have something to do with super hero framed photos.. I could be wrong. Below if you're planning your wedding on a budget, and I think you should.. you can buy a wedding gown here for between $90 to $200, seems fair for something you'll hopefully only wear once..
Or you could sit for a bit and have your portrait sketched, I didn't and I suspect Leo didn't either.. I did buy some seasonal fruit and veg..very fresh! I already have everything I need for belly dancing! ... or flowers that last for a week if you're lucky. I choose the latter..always! Hope that you had or are still having a fab weekend. It's a long weekend here in Austalia, sleep in tomorrow yay! Happy Monday, take care and stay safe..
'Courage in adversity' the Anzacs.. It doesn't matter how many times you have the opportunity to watch the sun come up over the horizon each time is a breathtaking moment. I took these shots just as dawn was breaking two days ago looking over the city from Kings Park. It's especially poignant at this time of the year when we remember the courage and bravery of the Anzacs and of the men and women who have lost their lives in war over the last 100 years. It's beyond sad to think that while remembering the bravery of the men who fought and died in the hope of peace the war still goes on.. for the first time in nearly a century the police force here and around Australia will break with tradition and be armed in response to safety concerns. ... and there it is, a golden glowing orb of hope! They were preparing the park when we were there for the expected 60,000 people attending the dawn service, if you've ever heard 60,000 people sitting in complete silence it's an unbelievable experience.. 'lest we forget'. Take care and stay safe..p.s. there were close to 80,000 people at the dawn service..
Anzac Cottage, getting ready to recieve.. This Saturday, the 25th of April, Australia and many other parts of the world are preparing to commemorate the centenary of Anzac Day (Australia and New Zealand Army Corps). A few days ago I zipped over to Mt Hawthorn to take a few shots of Anzac Cottage, 'Australia's first World War I memorial: a practical memorial, in the form of a home for the first wounded Anzac soldier to return to Mt Hawthorn from the ill-fated but legendary Gallipoli campaign'. Read the full story here. I smiled to see the bucket and window wiper to the left, Anzac Cottage, already looking ship shape was getting an extra spruce up! Tomorrow I'll show you why I was heading down the Mitchell Freeway to the city at 5.30am yesterday morning :) Happy Friday, take care and stay safe..
'Karrak'.. Red Tailed Black Cockatoo.. If ever a building needed (t)arting up it's the Water Corp building in Leederville, no disrespect to the architects but it is a little functional :) I do sometimes wonder how architects feel about the huge, often unrelated to what goes on in the building, murals painted on their creations. In this case the murals are water themed.. wise choice. The pair of Ibis (water birds) above by Perth artist James Giddy who you've seen many times here, absolutely enhances and the giant wave covering three walls by traveling Chinese artist DALeast, see more of his work here, is spectacular in it's detail (so worth enlarging) I wouldn't be surprised if you've already seen his work in your city. Both murals are part of FormPUBLIC 2015. So much art so little time to check it out :) Happy Wednesday, take care and stay safe.. p.s. thanks for all the lovely comments yesterday, catch up today! To see more murals from around the world check here..
Now that I've got your attention :) With the trip to Sydney I almost let another anniversary slip by, I think I did last year. Amazing to think Perth Daily Photo is four years old and like most city daily photo blogs around the world the inspiration came from my daily visit to M. Tenin's Paris Daily Photo, I still miss that visit each morning! I thought it was only fitting to celebrate going into the fifth year with many a few pics of another hot Frenchman :) He didn't start off his act shirtless, let's begin at the beginning.. He was brilliant including the younger audience..
.. and just in case anyone was losing interest.. check out some of the audience expressions, too funny! Here's to another fun year, hope you'll tag along :) Have a fab Tuesday, take care and stay safe.. p.s. any Perthites out there know this gentleman's name? p.p.s. William street performer thanks Andrew..
Aboriginal painting is 'not mere illustration , but real-time communion with ancestral relations and their sacred geographies'. I was invited to visit 'Revealed', an exhibition and marketplace 'showing and linking emerging Aboriginal artists and arts centres from across WA with audiences and opportunities in Perth'. Launched in 2008 this biennial event is growing each time and it was excellent yesterday to see the 'marketplace' event in the cultural centre teeming with fabulous art and appreciative buyers! Over at Gallery Central it was a little quieter, allowing for a more detailed study of these amazing art works. The three dimensional aspect in the piece in the first shot depicting freshwater mussels collected from billabongs and rivers was fabulously mesmerizing. Aboriginal artwork is unique in so many ways, bringing families, 'grandmothers, mothers, aunties and children together to paint and share laughter and stories'. 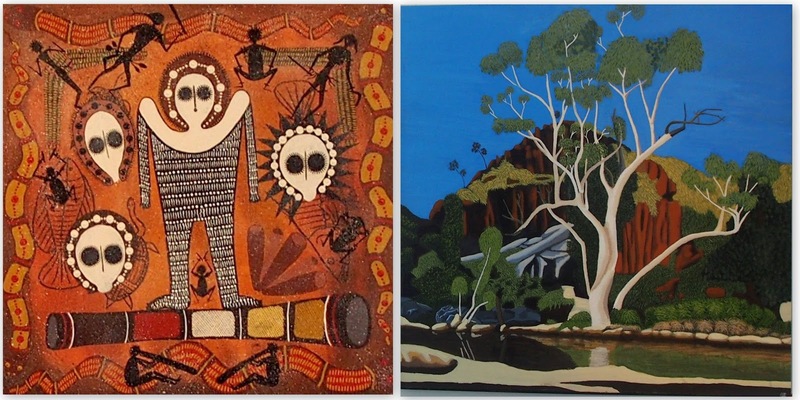 I heard Aboriginal art once described as 'history, written by the people'.. it sounds right! The 'Revealed' exhibition will be showing at Gallery Central until the 9th of May, so worth a visit if you happen to be in Perth.. Can't believe the weekend is overs already, Perth you're exhausting me :) Happy Monday, take care and stay safe...p.s. I told you it was special! Driving in the fast lane! A bientot, see you soon! Flying carpets, magical trees and princesses! St. Alban's Highgate.. Happy Easter. Chinese Lanterns.. thirteen dollar beauties! Things that caught my eye in Fremantle..
CDP Theme day.. 'My camera-shy self portrait'..